The Advent season is a time of preparation directing our hearts and minds to Christ’s second coming at the end of time and also to the anniversary of the Lord’s birth on Christmas. 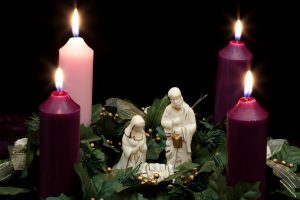 Below is a list of things you can do to make Advent a wonderful time for all in your family or parish. 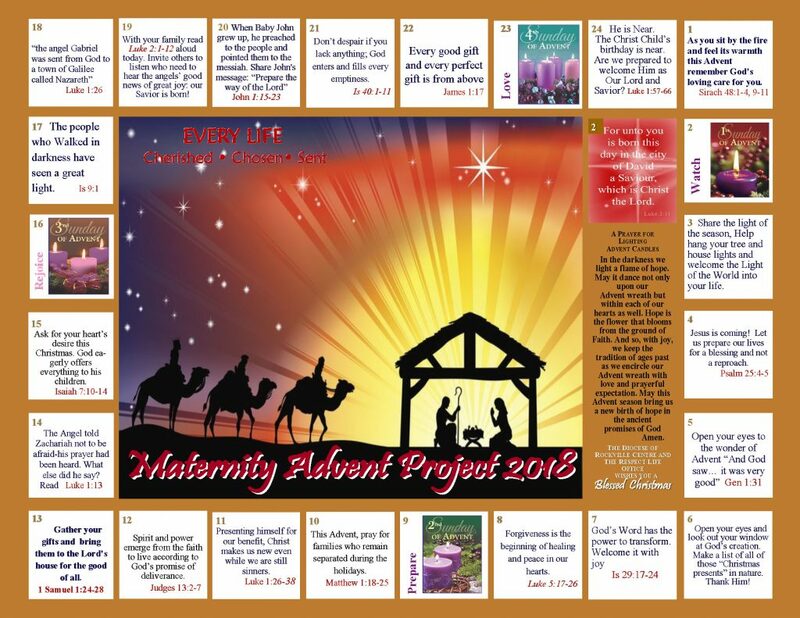 Use these Lectio Divina guides to meditate, contemplate, and pray on your spiritual preparation for Advent and Christmas. La Lectio Divina es una forma de meditación arraigada en la celebración litúrgica, que se remonta a las comunidades monásticas. Era un método practicado por monjes en su encuentro diario con la Escritura, tanto mientras se preparaban para la Eucaristía y al orar la Liturgia de las Horas. An article discussing ways to bring in the Advent season to your children making it an opportunity for this mindful pause during the busy Christmas season. 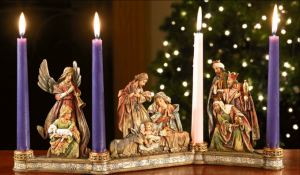 An article discussing the symbols and traditions that enhance observance of Advent. 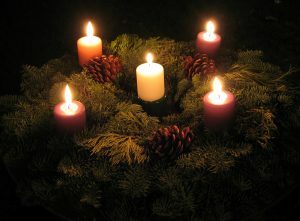 The use of the Advent Wreath is a traditional practice which has found its place in the Church as well as in the home.Traditionally, Advent wreaths are constructed of a circle of evergreen branches into which four candles are inserted, representing the four weeks of Advent. Ideally, three candles are purple and one is rose, but white candles can also be used. 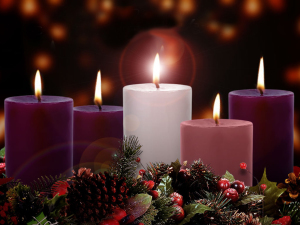 The blessing of an Advent Wreath takes place on the First Sunday of Advent or on the evening before the First Sunday of Advent. When the blessing of the Advent Wreath is celebrated in the home, it is appropriate that it be blessed by a parent or another member of the family. In its present form the custom of displaying figures depicting the birth of Jesus Christ owes its origin to St. Francis of Assisi, who made the Christmas crèche or manger for Christmas Eve of 1223. The blessing of the Christmas manger or nativity scene may take place on the Vigil of Christmas or at another suitable time. The Festival of Lessons and Carols is a service of Scripture and song that dates to the late 19th century. In this service, we listen to nine Scripture lessons which recount the Fall, the promise of a Messiah, the Incarnation, and the Great Commission to preach the Good News. Each lesson is followed by a carol or other song that reflects on the lesson’s message and a brief prayer. The Roman Church has been singing the “O” Antiphons since at least the eighth century. They are the antiphons that accompany the Magnificat canticle of Evening Prayer from December 17-23. They are a magnificent theology that uses ancient biblical imagery drawn from the messianic hopes of the Old Testament to proclaim the coming Christ as the fulfillment not only of Old Testament hopes, but present ones as well. Their repeated use of the imperative “Come!” embodies the longing of all for the Divine Messiah. “Charitable actions by which we help our neighbors in their bodily needs” ( USCCA ). They respond to the basic needs of humanity as we journey together through this life. FEED THE HUNGRY: Consider how good stewardship practices can benefit others. GIVE DRINK TO THE THIRSTY: Support the efforts of those working towards greater accessibility of this essential resource. SHELTER THE HOMELESS: There are many circumstances that could lead to someone becoming a person without a home. VISIT THE SICK: In spite of their illness,take the time to visit and comfort these individuals. VISIT THE PRISONERS: People in prison are still people, made in the image and likeness of God, they deserve to hear the Word of God. BURY THE DEAD: Funerals give us the opportunity to grieve and show others support during difficult times. Through our prayers we show our respect for life, which is always a gift from God. Just as Jesus attended to the spiritual well-being of those he ministered to, these Spiritual Works of Mercy guide us to “help our neighbor in their spiritual needs” (USCCA). COUNSELING THE DOUBTFUL: Remember that Christ is the Way, the Truth, and the Life turn to him. INSTRUCTING THE IGNORANT: Learn about our faith and be open to talking with others about our beliefs. ADMONISHING THE SINNER: Do not judge, but be supportive in helping others find their way and correct their mistakes. COMFORTING THE SORROWFUL: Be open to listening and comforting even if we aren’t sure of the right words. FORGIVING INJURIES: Jesus teaches us that we should forgive as God forgives, relying on him to help us show others the mercy of God. BEARING WRONGS PATIENTLY: Do not be bitter about wrongs done against you. Place your hope in God so that you can endure the troubles of this world and face them with a compassionate spirit. PRAYING FOR THE LIVING AND THE DEAD: Prayer is one of the most powerful ways we can support others.